Babcock has commenced construction of its floating Light Detection and Ranging (LiDAR) system, designed to provide critical meteorological data for offshore wind farm developers safely, reliably and more cost-effectively than has previously been feasible. While meteorological monitoring systems, including LiDAR, are commonly used on-shore by the renewable energy industry and by military and aviation organisations, their deployment offshore has to date been limited by the high cost of constructing fixed platforms for meteorological mast installation (typically costing several million pounds), and the technical challenges of using a floating platform which is quicker to deploy and less costly but makes gathering accurate, high quality data considerably more complex. LiDAR systems measure wind speed and direction by comparing the light from a laser beam, reflected by microscopic dust particles in the atmosphere, to a reference light source. By measuring the change in the reflected light’s frequency, caused by the Doppler shift, the speed and direction of the dust particles, and hence wind velocity and direction, can be determined. High levels of motion from a floating offshore platform, however, affects the quality of the data collected, requiring either a physical motion compensation system, or post-processing of data using complex algorithms. To address these high costs and challenges (which are increasing further as the offshore wind and marine energy developers move into deeper water further offshore) Babcock has applied its extensive marine industry experience and domain knowledge to produce a floating platform with the low motion characteristics necessary to allow wind measurements to be obtained with the required levels of accuracy, while minimising costs. Babcock’s floating LiDAR system has been designed to provide the stability to deploy measurement and monitoring sensors on a floating platform to collect reliable data to support offshore wind farm planning, development and operation, without the need for compensation systems or complex data processing algorithms. In addition to the platform design, Babcock has developed an integrated power (supplied by photovoltaic panels and micro wind turbines installed on the buoy) and communication system to facilitate remote, autonomous operation of the system, reducing the need for regular visits to the platform. Moreover, when routine six-monthly maintenance visits are made, the platform’s stability also makes for safer access and working onboard. A six month trial of the Babcock floating LiDAR system is now set to take place, hosted by RWE Innogy, at a location adjacent to the fixed met mast at RWE’s Gwynt y Môr (one of Europe’s largest offshore wind farms) off the north Wales coast in the Irish Sea. The trial, which will allow a detailed independent assessment of the system (comparing the data with information from the met mast), is part of the Offshore Wind Accelerator (OWA) programme, promoted and co-ordinated by the Carbon Trust with the aim of reducing the cost of offshore wind power. Babcock is currently assembling its LiDAR system and associated ancillary power systems for testing at its Rosyth facility prior to deployment and final commissioning at the Gwynt y Môr site. 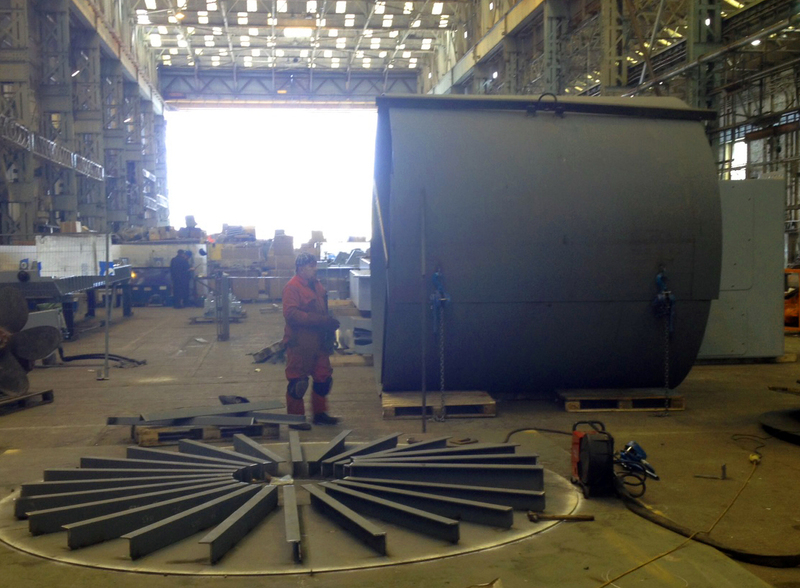 Fabrication of the buoy is being undertaken in Birkenhead, the chosen site for deployment. Gwynt y Môr offshore wind farm will consist of 160 turbines and is being built in Liverpool Bay, off the North Wales coast. The project is being funded by RWE Innogy, in partnership with Stadtwerke München GmbH, and Siemens AG. Once operational, Gwynt y Môr will have an installed capacity of 576MW, using Siemens 3.6 MW turbines and generators. It will be capable of generating enough energy to meet the average annual energy needs of around 400,000 homes. Construction is now well underway in north Wales and offshore in Liverpool Bay. The wind farm is due to be fully operational by the end of 2014.